Fill joints and seams for rigid vinyl sheets and profile products with InPro® Vinyl Seal. Available in 92 different standard colors. Joint size not to exceed 1/4"
Note: This product may stain adjacent walls or wallcovering. Masking of these areas may be necessary. Test an inconspicuous area to see if staining will occur. Complete your wall panel, strip, and roll installation with InPro® Vinyl Seal. 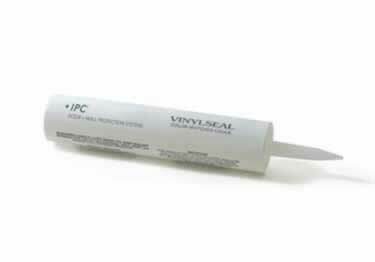 Vinyl Seal is used to fill joints and seams, is available 92 different colors, and comes in a 10.5 oz. cartridge.